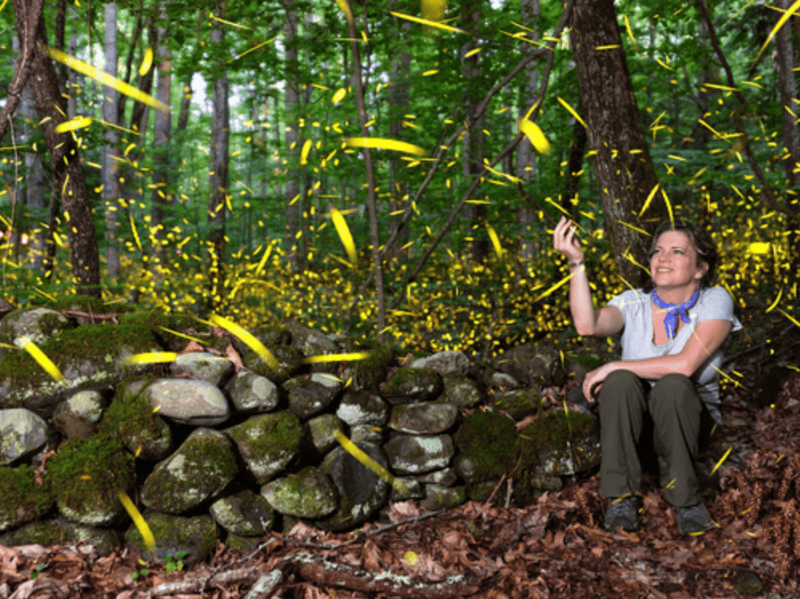 Every year for just a few precious weeks in late spring, the fireflies of Great Smoky Mountains National Park put on a mind-bending, magical show. Come nightfall, tens of thousands of lightning bugs synchronize their lights and flash in unison. The most-visited park in the United States is the only place in America where it happens, and it's one of nature's most amazing spectacles—right up there with the Aurora Borealis, sailing stones, and Monarch Butterfly migration. One of 19 species of fireflies in the Great Smokies, the famous synchronous fireflies take from one to two years to mature from larvae to adulthood, but once they reach adulthood they will live only about three weeks. The flashing patterns are thought to be part of the fireflies' mating ritual. The males fly and flash and then the females, remaining stationary, respond with their own flash. Scientists don't know for sure why the fireflies flash synchronously but they believe one reason might be competition between males to be the first to flash or produce the brightest bioluminescence. The dates for the two-week mating period when the fireflies begin to display varies from year to year. Scientists don't know why, only that it seems to depend on temperature and soil moisture. It's impossible to predict in advance exactly when the insects will begin flashing each year but peak flashing for synchronous fireflies is typically within a period in late May to mid-June. Before the peak period, the number of flashing fireflies builds a little each day. After the peak period, the flashing gradually declines until the mating season is over. Since 1993, this peak date has occurred between the third week of May to the third week in June. Weather: On misty, drippy evenings following rainfall, the insects may not readily display. Temperature: Cool temperatures below 50 F will also shut down the display for the night. Moon phase: This has also been known to affect the timing of nightly displays. On nights with a bright moon, the insects may begin flashing a bit later in the evening than usual. During the peak flashing weeks, visitors come to the Great Smoky Mountains by the thousands. The event has become so popular that the Great Smoky Mountains National Park has had to limit the number of people that can view the fireflies each night. The park sells a limited number of passes to the synchronous firefly viewings at the Elkmont Campground, the site where the flashing is most intense. The tickets go on sale in late April for designated viewing dates. Want to attend? You must enter a lottery at recreation.gov to snag a parking spot at the Sugarland Visitor Center beginning in late April. If you are awarded one (you'll be notified within a few weeks), it'll cost you $20 and is good for up to six people per vehicle. Then, a shuttle trolley will take you from to the Sugarlands Visitor Center to Elkmont, and that ride costs $2 (cash only). Only use a flashlight while walking on the trail, not once at the campground viewing area. Keep it turned off when fireflies are flashing. Do not try to catch the fireflies. Respect the habitat.